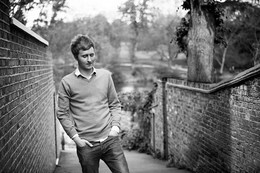 Author and screenwriter William Thacker was born in London in 1986. His debut novel, Charm Offensive, was published by Legend Press in 2014. Lingua Franca, his second novel, was released in 2016. William is the co-writer of England Is Mine, the feature-length Morrissey biopic released worldwide in 2017. He co-wrote the short film, Full Time, winner of the Best Film award at the 2014 Shanghai International Film Festival. William is represented by James Wills at Watson Little.